After several recent restaurant closings due to the economy, there is even more bad news for NC barbecue fans: according to WRAL.com, a kitchen fire has temporarily closed down Holt Lake Bar-B-Q & Seafood in Smithfield. Although I was underwhelmed by Holt Lake Bar-B-Q on my visit there, the joint has many loyal customers who will be much less happy at meal time in the coming weeks. The good news for the joint’s customers and 20 employees is that it sounds like the owners will work hard to re-open as soon as they can. 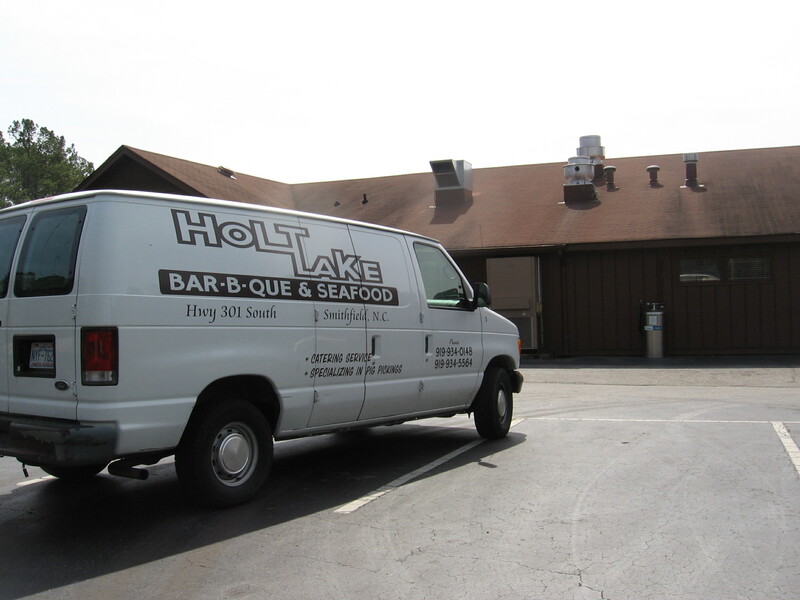 I wish Holt Lake Bar-B-Q all the best for a speedy recovery. And maybe they will take the fire as a sign from above and decide to rebuild with the addition of some traditional wood pits so they can keep the fire outside the restaurant! Smithfield Foods is the world’s largest pork producer and is based in the small town of Smithfield. Virginia. Though Smithfield, North Carolina is not actually the home base of the world’s largest pork producer, it is in the heart of the state’s swine belt and has a rich history related to the golden leaf. It is also Ava Gardner’s home town, so I would guess she ate her share of barbecue plates back in the day, and the Ava Gardner Museum downtown is a featured attraction. Smithfield also hosts the annual Ham & Yam Festival, which was held just a few weeks ago. Although the festival won’t be back until Spring 2010, Smithfield, NC is a nice little town that is working hard to revitalize its historic downtown (Smithfield dates back to 1777) and it’s worth a visit. By now you may have wondered why I am starting my review of Holt Lake Bar-B-Q with all of this information on the town of Smithfield. I want you to know there are many good reasons to visit Smithfield. Holt Lake Bar-B-Q simply isn’t one of them. Just a quick post to encourage you to check out the Ham & Yam Festival, which runs through late Sunday afternoon in downtown Smithfield. Note that barbecue plates from the pig cooking contest will be on sale from 12:30 until 5:00 p.m. on Sunday. Sorry we didn’t get this post up with more advance notice; the barbecue festivals snuck up on us this year. We vow to do a better job of informing you, our loyal readers, of essential upcoming events in the future. Until then, we ask that you forgive us our trespasses as we have forgiven those who abandon the almighty hickory wood. Speaking of which, please forgive me for the below photo. It has nothing whatsoever to do with the Ham & Yam Festival, but I took it last time I was in Smithfield and this seems like as good (or bad) an occasion as any to share it.